Only make your Merchant Fullfilled inventory available on Amazon once your FBA inventory runs out of stock. Prefer FBA is a feature that is used if you don't want to list both the FBA and FBM versions of a product to Amazon at the same time. This is useful for sellers who would strongly prefer FBA inventory to be sold on Amazon over the corresponding Merchant-fullfilled inventory of that product. SKU_A is an FBA SKU with 5 units at the FBA warehouse. The corresponding merchant-fulled SKU is SKU_A+MF+ which has 10 units at your Merchant Fulfilled warehouse(s). While Prefer FBA is enabled, Zentail will tell Amazon that SKU_A+MF+ is not available for purchase. SKU_A will still be available for purchase on Amazon. As soon as SKU_A runs out of stock at FBA, Zentail will alert Amazon that SKU_A+MF+ has inventory and is available for purchase! On your Integrations page, click on the Amazon tab. 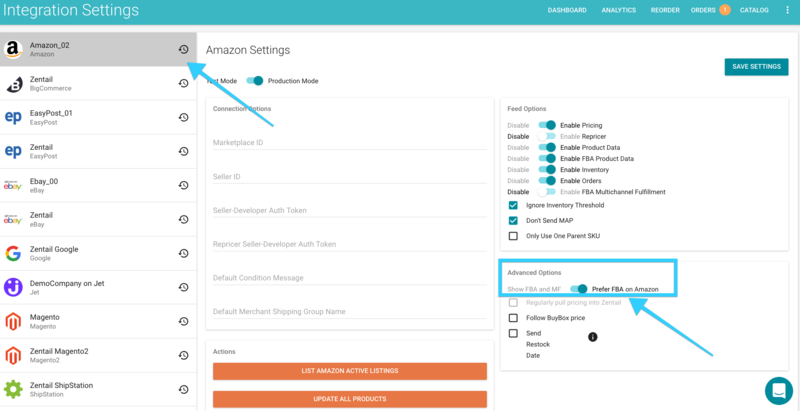 Under Advanced Options on the right side of the screen, you will see "Prefer FBA on Amazon"
When the toggle is flipped, Zentail will only make the +MF+ (or the merged Merchant Fulfilled) version of your SKU available for purchase on Amazon when the FBA inventory runs out of stock. Why do I have SKUs with "+MF+" in Seller Central?